It appears that humans aren't the only animals who catch fish by fishing or angling. The longlure anglerfish (Antennarius multiocellatus) and other anglerfish species came up with this idea long before we did. Most animals either adapt to their surroundings to make their life easier or, in some cases, might make some sort of tools to make life easier. For example people make tools such as fishing poles to make catching fish easier and one of the best ways to make hiking easier is through the use of trekking poles. These items make life easier for us. Anglerfish don't have the ability to make tools, but they evolved in such a way that their own body can assist them in capturing food. All anglerfish have a modified dorsal spine (the illicium and the esca) that extends from the top of their heads. This modified spine serves as a lure for catching fish. The illicium serves as the "fishing line" and the esca serves as the "bait" or lure. The lure dangles near the anglerfish's mouth and when an unsuspecting fish comes along to check out the lure, the anglerfish eats it whole. Anglerfish are able to wiggle the lure at will to attract fish. Watch the You Tube video below to see a close-up view of the anglerfish (frogfish) illicium and esca. The first part of this short video shows the red-lipped batfish. Longlure anglerfish are so named because their illicium (the fishing line) is longer than in most other anglerfish species. Because of their predatory nature and their method of obtaining prey, anglerfish are quite interesting, but not necessary attractive fish. 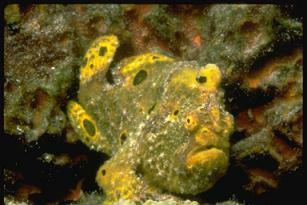 Longlure anglerfish are commonly called longlure frogfish due to their appearance. They have modified scales called dermal spicules that are said to resemble warts on a toad. However, the appearance of anglerfish serves them well because they are well camouflaged against the rest of the ocean floor or coral reef background, enabling them to catch more fish and crustaceans. In fact, their appearance probably evolved this way because the anglerfish that caught the most fish are the ones who survived long enough to spawn. If anglerfish were conspicuous they probably wouldn't catch many fish. Angling device or not, if other fish knew the anglerfish was there they probably wouldn't take the bait. Longlure anglerfish belong to the family Antennariidae. They can reach a maximum size of about 8 inches in lenth (20 cm), but are usually much smaller. Their coloration is somewhat variable - they can be yellow, red, or brown. The longlure anglerfish is not considered a good community aquarium fish because of its predatory nature and large appetite. If you do keep this fish in your aquarium you will need to give it a meaty diet. If you don't want to continue feeding it live foods you can try to wean it off of live fish by using feeding sticks to wave pieces of fish or crustaceans in front of it. Live saltwater feeder shrimp can be given as well. In their natural habitat most anglerfish don't feed everyday, usually feeding anglerfish 2-3 times per week is sufficient. The longlure anglerfish is found in the western Atlantic Ocean and usually inhabits shallow reefs. It is a bottom dwelling fish and it gets around by "walking" on its pelvic fins. There are other species of anglerfish that live very deep within the ocean, but these deep sea anglerfish aren't kept in home aquaria. Because of their predatory nature, if you decide to keep the longlure anglerfish in your aquarium be forewarned that it can eat fish and crustaceans that are as large as itself. A species only tank might be best for this fish. Copyright © 2008-2019 AboutFishOnline.com. All rights reserved. Longlure anglerfish image from the Corel corporation and may not be copied.